Over the years of researching and creating In Search of Israeli Cuisine, we've be been asked many times for recommendations of where to eat and visit in Israel. This is a list of some of our favorite people and places: many from the film, and many more wonderful people! A fabulous wine bar where you can taste many wines. Very high tech: they give you a credit-type card, you choose from dozens of wines, get a lovely taste. Or, a glass, or a bottle, or a case. Food too. Jonathan Borowitz's Cafe 48 served excellent Ashkenazi inspired food, but is now unfortunately closed. His new restaurant. Meat25, is located in Carmel Market and is both a butcher shop and a wonderful restaurant, perhaps the best grilled meat served in Israel. Miznon is Eyal Shani’s hip “gourmet fast-food” spot which serves as both a new take on and an homage to Israeli street food. Eyal Shani is a "mad genius" who provides unexpected yet familiar dishes. Expect to find ridiculously tasty vegetables, stuffed pitas, and much more served in a relatively inexpensive and very “Tel Aviv” restaurant. Favorites include the corned beef pita, the roasted cauliflower, and their steak & egg pita. Meir Adoni is one of Tel Aviv's leading chefs, at the forefront of haute cuisine in Israel. He was raised with a Moroccan upbringing, and fuses his Moroccan grandmother's inspirations with Modern Jewish cooking to play with old and new recipes. "As a chef, the first thing I bring to the table is tradition. I respect the original flavors and ingredients. Only then do I add my crazy interpretation, launching the dish off to new and uncharted territory." Nur, is Meir's New York restaurant that received two stars from the New York Times. He describes it as Middle Eastern, not Israeli. It's WONDERFUL! Unique and exciting high-culinary art cuisine from Meir Adoni, served as Degustation menu. Meir Adoni’s inventive and surprising all-Kosher restaurant with a spectacular rooftop view on top of the Carlton hotel in Tel Aviv. Haim Cohen was one of the pioneers in the gourmet restaurant scene in Tel-Aviv years ago. Now, his new restaurant "Yaffo TLV" connects the roots of Israeli cooking with the cooking of his Ashkenazi grandmother. 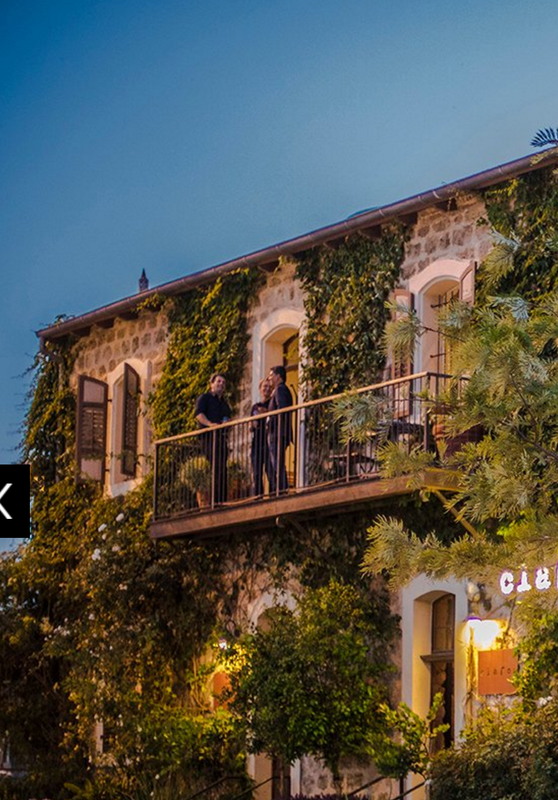 A restaurant born from culinary conflict between eastern and western flavors, Yaffo is a culinary love letter to the distinct flavors of the Jewish experience. The menu changes each day to reflect the fresh ingredients the restaurant sources. "Delightfully delicious food from someone who truly knows what he’s doing"
Simple, delicious, traditional Tripolitan comfort food served in an unassuming casual restaurant near Old Jaffa. Specializes in the most delicious, traditional foods possible. Savory stews are served alongside a variety of bright and interesting mezze. Israel Aharoni is a celebrity chef in Israel who is famous for his Asian cuisine. A leading voice in the Israeli culinary scene, he is most famous for introducing Chinese food to Tel Aviv with his restaurant "Yin Yang." He recently opened Hiro, a free-style ramen soup bar, in Sarona Market. A trendy wine bar in Sarona Market with an automated pouring system allowing the customer to taste 40 wines from Israel and abroad by the use of a smart card. A famous sabich stand in Israel. Maybe the most famous sabich stand in Israel. Israelis argue about who serves the best sabich, but they all agree that Oved serves an excellent one. If you like the heat, make sure to get yours spicy. For the uninitiated, a sabich is pita stuffed with fried eggplant, potatoes, hard-boiled egg, hummus, tahini, and whichever veggies and spices you’d like. In one bite you'll get a taste of dozens of different cuisines. Inexpensive, too. This tiny restaurant and wine bar serves food straight from the surrounding Carmel Market, focusing on fresh vegetables and seafood. Small and very popular, so be sure to make reservations. Chef Maoz Alonim focuses on serving dishes that highlight their basic ingredients - simple, fresh and delicious. A grill in Jaffo that serves variety of grilled meats, including foie gras roasted over charcoal - one of chef Michael Solomonov’s favorite dishes. Also serves generous courses of Salatim to accompany the grilled meats. Gourmet chocolate made with a fusion of European tradition and Israeli tastes. Ika Cohen has won many international awards for her chocolate and has been making chocolate for more than a decade. Make sure to try the za’atar flavored truffle - unlike any other sweet you've tried. Yitzhak Hizkiyahu is a Jewish Ethiopian serving the cuisine of his homeland in Tel Aviv. The food is all vegan - and all delicious. All of the dishes served are healthy, tasty, and unique. It's a tiny little stall that you could walk right by - but make sure not to. Here a man named Benny Briga serves fresh made sodas and seltzer waters. Benny used to be a mixologist and a bartender before taking his passion for crafting delicious beverages into the world of gourmet sodas. Benny makes soda in the style of the old soda fountains - but with a new Israeli understanding of global ingredients and flavors. Julie's is located in Carmel Market, just a few blocks from the center of the market and just above the Yemenite Quarter. There's no reservations, she serves only lunch, and she closes when she runs out of food for the day. Her Egyptian specialties however are worth it. Every day Julie can be found making her rounds in the market, shopping for fresh vegetables and creating the unique menu for the day. Her Egyptian specialties include artichokes, and Molokheyya, a green plant chopped and cooked with garlic and coriander sauce often served as a soup. You'll want to give Julie a big hug once you meet her, and you'll find that the perfect addition to her food is a dash of her wisdom. Serves authentic shawarma on fresh-baked laffa straight from the taboon, with arguably some of the best lamb shawarma in town. Get your laffa stuffed with everything, grab some extra napkins, and thank us later. A small Persian restaurant that celebrates the Jewish Persian cuisine. Serves amazing Persian rice dishes along with Gondi soup. Great lunch spot in Kfar Saba.